Holiday Inn Simmons Beautyrest Hotel Mattress for Plus Size People. Home → Mattress Protectors → Danican Waterproof Mattress Protector → Holiday Inn Simmons Beautyrest Hotel Mattress for Plus Size People. I’m looking to buy a new mattress, and would prefer a king size. We had slept on a king size mattress at a Holiday Inn and it was the best night sleep that I ever had. It was super soft! I currently have a queen size that’s a year old and I hate it! My husband and I are both plus size, he’s about 340 lbs and is 6’3. I’m 250 and 5’5. I know that weight is a factor when choosing the right mattress. I’m just not sure on where to begin. The Holiday Inn uses Simmons Beautyrest mattresses. However, nothing Simmons makes is designed to hold that kind of weight for more than a year…if that long. What makes a Beautyrest so comfortable, is the contouring support of the individually pocketed coil system…with each coil moving independently from the next. Between the fact that their coils are made of raw steel, (Not tempered steel), and the upholstery is mostly memory foam, these mattresses are designed to need replacing every couple/few years. Even with the part time use they get at hotels, they are replaced every few years…what with the hotels being more concerned about comfort than longevity. My wife and I are large people…225 -235 lb range. We, too, enjoy the Simmons Beautyrest when we travel. 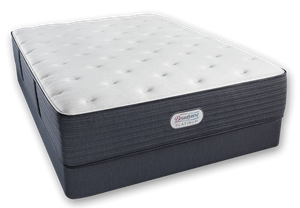 At home, we have a mattress from Natura, which uses the same coil system as Simmons. The differences are: The coils are twice tempered and the upholstery is natural Talalay latex. Latex is and has been thee best upholstery material for the last 100 years. “Best” meaning most comfortable, most resilient & longest lasting. Memory Foam has proven itself to be the worst upholstery material ever invented…over the 20 years it’s been on the market. So, substituting high quality components for the low quality components, makes all the difference in durability. But, because the components of the Natura Greenspring mattresses is so great, they don’t have one that is really soft. My wife and I have the “Liberty Ultra Plush” model, but still added a s latex topper to it, to make it as comfy as we like. You will need to do the same thing. Both products can be ordered online.Natura mattresses take about 4 weeks to arrive.